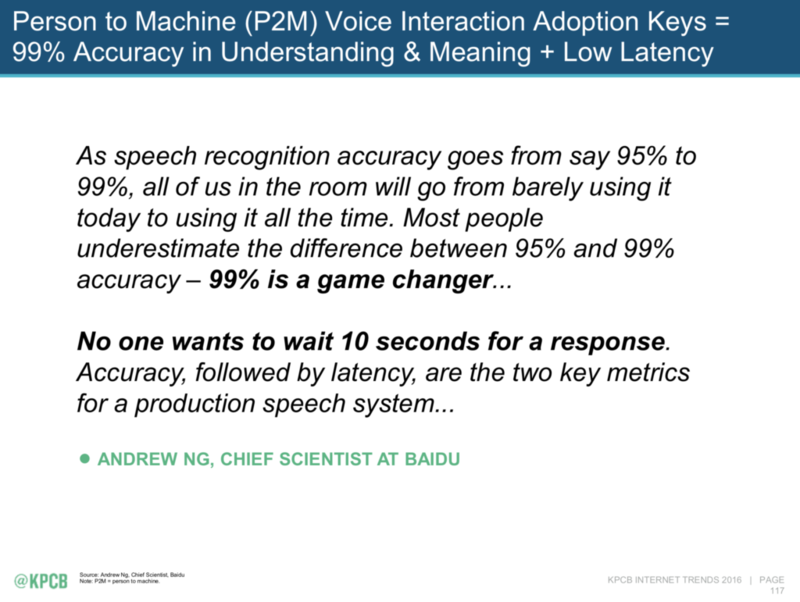 Apple and Mary Meeker agree: we’re living in an increasingly voice-first world. But how well is Apple adapting? On May 30, Kleiner Perkins venture capitalist Mary Meeker, one of the most influential pundits in digital, released her annual Internet Trends report. The uptake of voice-based digital interfaces was a significant theme. She identified voice as one of nine areas where innovation and growth are occurring as U.S. internet usage continues to growth. 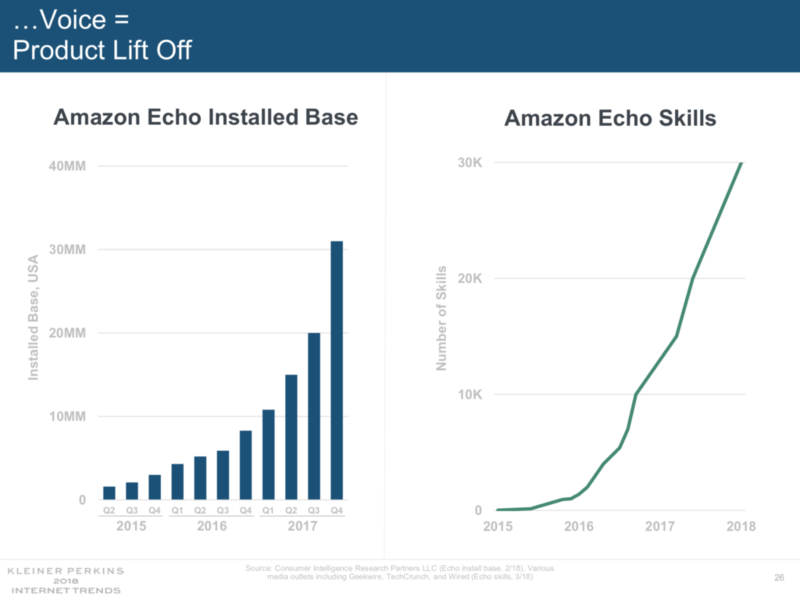 “With voice, we’ve hit technology liftoff with word accuracy and we’ve certainly hit product liftoff with Amazon Echo’s install base estimated to be around 30 million plus,” she said, as she presented her report at the 2018 Code Conference. And she presented slides to illustrate her point. 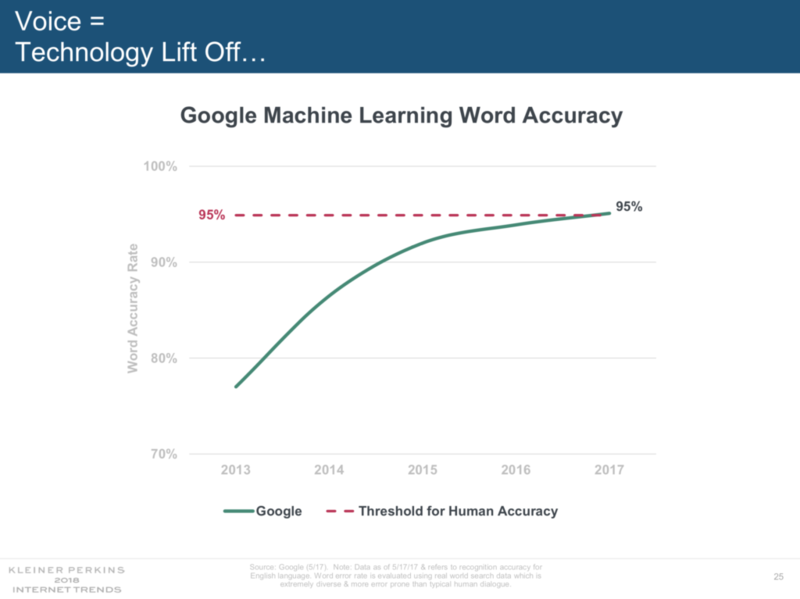 According to Meeker’s 2018 report, we’ve now approaching that point where accuracy rates will trigger widespread adoption. As Meeker noted, sales of the Amazon Echo have been phenomenal – an example of a technology company identifying a need that people did not know they had. And the Echo is an important, but not the only, barometer of voice’s uptake. Businesses such as Amazon, Apple, Google, and Microsoft are competing to make voice-based interfaces a natural part of inhabiting in our homes, getting work done, and living on the go. Amazon has been taking some important steps to encourage the uptake of voice, such as the launch of Alexa Blueprints, which makes it possible for anyone to create their own Alexa skills and responses with the popular voice assistant – and no coding is required. Making Siri smarter and more efficient. Apple announced that Siri will learn from user behavior and provide suggestions and reminders based on what Siri knows about you. For example, if Siri detects that you’re running late for a meeting, Siri will prompt you to let your meeting host to know. In addition, Apple announced a Shortcuts tool that makes it possible for users to create truncated commands such as “Surf time” to prompt Siri to look up weather reports for your beach fun, or “Hey Siri, I lost my keys,” which prompts Siri to talk to the Tile app and sound the dongle on your key chain to make them easier to find. 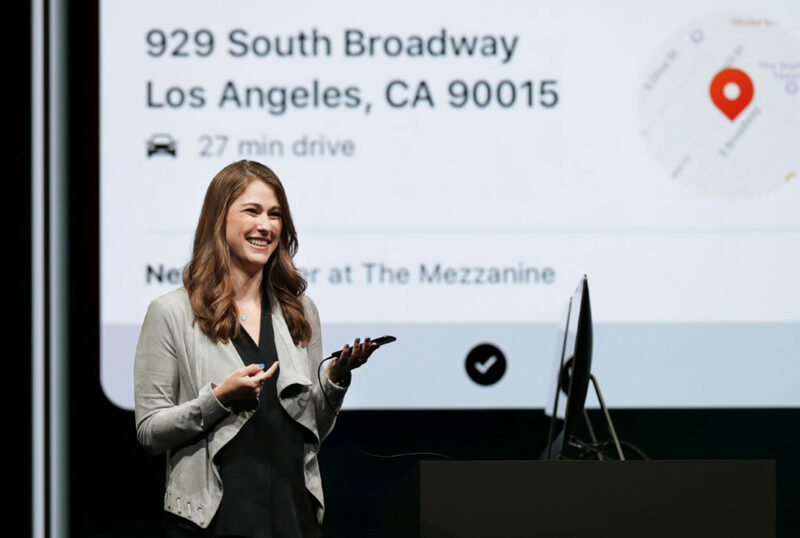 At WWDC, Apple’s Kimberly Beverett shares Siri Shortcut features such as ordering coffee. Image source: Apple. 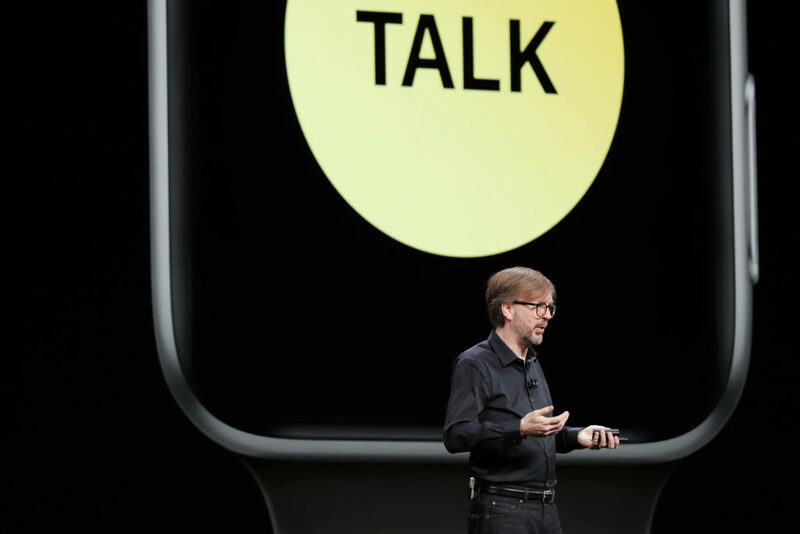 Apple’s Kevin Lynch introduces Walkie-Talkie at WWDC. Image source: Apple. Of the two changes noted above, Walkie-Talkie is more intriguing. To be sure, using artificial intelligence to make Siri smarter and more useful is important. Siri suffers from a longstanding reputation for being a laggard, and Apple needs to make it better. But the functionality may not be terribly original as CNet notes, and Apple’s Siri-powered smart speaker the HomePod, is perceived as a weak contender. Apple’s voice future for now is doing a better job integrating voice into devices such as the iPhone and Apple Watch. But Walkie-Talkie shows that integrating voice does not always require Siri. In fact, Walkie-Talkie could make the Apple Watch more useful in jobs on the go that require rapid voice-to-voice communication, such as construction, event management, sales, security, healthcare, entertainment, and hospitality. Companies such as Nokia and Orion Labs cater to those types of businesses with products such as push-to-talk mobile applications and devices. Apple may have become a competitor for a sector growing into a $17 billion industry. Ironically, Apple has placed a bet on an interface hiding in plain sight amid all the discussion about voice assistants: person-to-person. This entry was posted in Apple and tagged Amazon, Apple, Echo, Mary Meeker, Orion Labs, Siri, voice, voice assistant, WWDC, WWDC18. Bookmark the permalink.